LabSolutions enables operation and control of LCs and GCs with the same interface. It allows simultaneous control of up to 4 systems from a single PC. Instrument information for up to 16 systems can be registered to a single PC, providing for a flexible laboratory environment that allows users to switch between networked LC and GC systems. Sharing the operating environment for LC and GC analysis reduces operator training time. 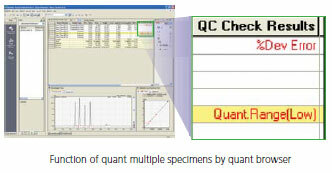 A quantitative results window enables easy review of data results and each chromatogram. LabSolutions supports the QC check by accuracy % and the range check to see whether a quantitative value falls within the range of the calibration curve; in addition, it supports calculation of impurity peak amounts, S/N ratio, and peak valley ratio. These various functions greatly reduce the time required for data analysis. LabSolutions allows users to customize the screen icons and layouts; therefore, the graphical user interface can be adapted according to individual preferences and workflow. 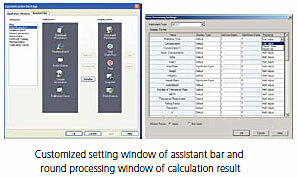 Even the rounding method and number of displayed digits for the calculation results, such as area, height, concentration and column performance parameters, can be defined in the system for consistency and individual laboratory requirements. System administration features, including system policy, user administration, log browser, and audit trail, are provided to assist users in FDA 21 CFR Part 11 compliance, which is supported and configurable on a stand-alone workstation as well as in a network environment. In addition, automatic registration of PDF files, which can be generated by LabSolutions as a standard function, into the database is available to support paperless operations in an analytical laboratory.